Orkut has just launched another feature which can be said 'Just another Copy' of a facebook feature. Orkut has had some updates of the late but this is one feature which would make orkut users not to leave the Orkut pages, for chatting. Now on you can chat from the orkut page and need not go to gmail for the same. If you have seen a message like this one on your orkut home page, this means Chat is live on Orkut. All you have to do is go to the settings page, and and select the Chat tab there. Therein you get an option to select which all friend groups to allow the chat feature to be used with. Once you select the desired friend lists, just save the settings and you are done. To chat all you have to do is to select the dot in front of the friend's name, and you can engage in chat with your friend. The status can also be selected within the orkut page. Just click the green dot on the top of the orkut page on the right of change theme link and select the status between 'online, busy, invisible and offline' amongst them. This way you can set your orkut online status. Here is a snapshot for ready reference. What do you think of the feature do tell us about that. Till than Keep orkutting and chatting at the same time. Orkut make new features everyday haha , but do you think that Orkut can beat the other chat service ? i am using orkut account with yahoo id and hav gtalk installed at my computer i?s it possible to save chat with my friends..
Yeah I think Orkut has copied many of the facebook features. Its cool though, they were pretty good features after all. @Santosh--You are right and i am very much concern with your point of view. I had not tried wave but I had hard much about its features. 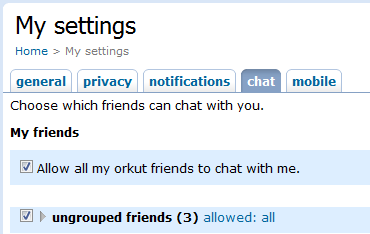 Meet friends on Orkut using the search feature or by joining communities. As well as provide the Live facilities to the Orkut users.